This is my second vintage of this wine and suffice to say that Arnot-Roberts continues to be a stand out and generate some major interest in the Bay Area. Although not exactly cult status, I’d have to say that along with Bedrock, Anthill Farms, Wind Gap Wines, and maybe you could throw Peay in there, these are definitely wineries that are making Syrah in the coolest-climate sites in California. This is Syrah on the edge. Day 1: This wine smells much more like a French Syrah than the majority of wines I’ve tried for this blog. It’s something about that gravelly brightness (yes, I’m consciously trying to avoid the minerality word here) and lack of any aromas of oak that set it apart and put it squarely into the French camp. It’s also got some unbelievable acidity that is almost overwhelming on first opening. It’s a wine that needs to calm down a bit. It’s got a lot of savory elements too, some green olive aromas with almost some brininess on the finish that I like but might be a little much for many. I’d definitely plan on decanting this wine or giving it a day on the counter after opening. I’m going to do the latter. Day 2: Some of that acidity has definitely calmed down a bit on the North Coast Syrah and the mid-palate while still lean has fleshed out a bit. I’m getting more fruit on the nose this time too: raspberry and strawberry still mixed in with those gravel aromas. Also a little hint of orange rind. On the finish, that brininess has gone away completely and I’m left with a nice silky transition from the mid-palate to the close. Word to the wise and lesson learned: This wine needs to relax after the first opening, let it breathe, it will mellow a bit and make it that much more delicious. BE PATIENT. The North Coast Syrah may be as cool-climate as it gets in California. At 11.9% alcohol, I think it’s the lowest alcohol Syrah I’ve had from California. The ’09 was 13% and I thought that was low but I’ve heard it said that many winemakers are afraid of picking their grapes too early because of the pervasive idea that the wines won’t reach phenolic ripeness (their full potential of complexity and aroma). The other fear I’ve heard is that the wines won’t develop a full and rich mid-palate. Well, this is one of the most aromatically complex wines I’ve had and its mid-palate, while not rich, is definitely full and textured. This is definitely a wine to seek out and the nice thing about Syrah is that even though this is a small winery with almost cult status, the wine should be available in some retail markets. If you find a bottle, I think you’ll be pleasantly surprised with a California wine that is decidedly un-Californian. And in this case, that’s cause for celebration. 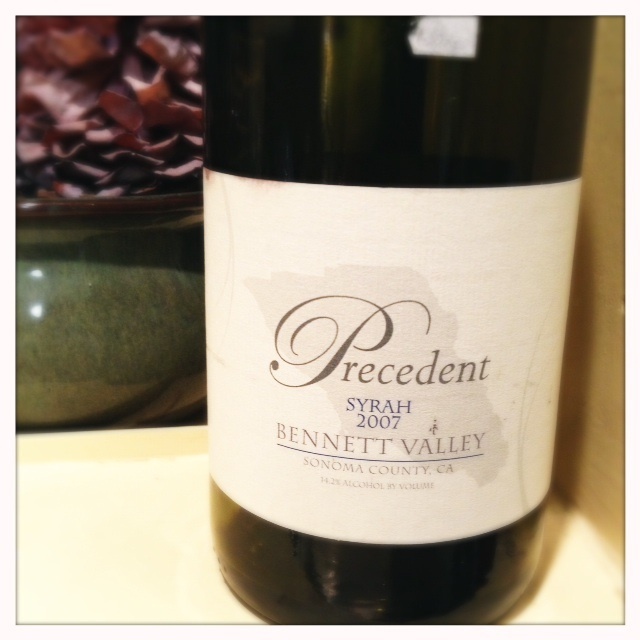 Bennett Valley is quickly becoming another interesting spot for Syrah. Just like the Yorkville Highlands, it’s one of those in-between areas, not exactly cool climate but also not exactly warm climate. The elevation along with cooling influences from the Pacific Ocean adds to the potential for long ripening and for a Syrah that develops those delicious secondary off-fruit flavors that I love. Precedent’s winemaker Nathan writes about the unique characteristics of the Bennett Valley on his website. “This valley is greatly affected by the cooling influence of the Pacific Ocean. This ensures moderate temperatures during crucial periods of maturation; heat spikes around harvest have ruined more grapes than we like to admit in California. We are able to get riper flavors, with higher acidity at lower sugars than many other parts of the north coast.” And that really is the driving characteristic of this area – it’s ability to bring some of that ripeness but maintain that acidity and savory-ness that makes Syrah truly what it’s supposed to be. The wine: there is some dark, big fruit here but also classic cool-climate aromas of black olive, plum, a tiny hint of oak. Also, some fairly pervasive minerality and something I haven’t smelled often on these wines — the best description I can come up with is that it smells like slightly smoky leaves. The palate is dry with persistent tannins and a hint of alcohol (although on the second day the alcohol blew off completely). The finish has a nice dry lift on the end with a fair amount of acidity. Suffice to say this is a wine made for aging. Precedent’s winemaker is Nathan Kandler, and right now he is also an associate winemaker at Thomas Fogarty in the Santa Cruz foothills. Precedent Wine is his side project and first solo project. He believes in a low-interventionist style of winemaking that emphasizes neutral oak, whole cluster fermentation and native yeasts. This wine was made with 50% whole cluster, crushed by foot to get fermentation going, and with native yeasts then basket pressed into barrels. The Syrah was aged for quite a while in barrel (about 15% new oak), and in fact, wasn’t bottled until 2010. The wine saw very minute amounts of sulpher and was bottled unfined and unfiltered. Only 140 cases of this wine was made. I managed to find my bottle at Robert’s Market in Woodside, CA. I look forward to trying more examples of Syrah from Bennett Valley, along with the Sonoma Mountain and Yorkville Highlands examples. I think they could really win bigger style wine drinkers over because they still have a fair amount of ripe fruit mixed in with all that savory goodness. Yes, Oregon does do Syrah, and not just in the southern, warmer part of the state. Even in the Willamette Valley where Pinot reigns, Syrah has gained a tiny foothold. Very few places experiment with it there but the places that do are worth seeking out. Cristom is one of those places. 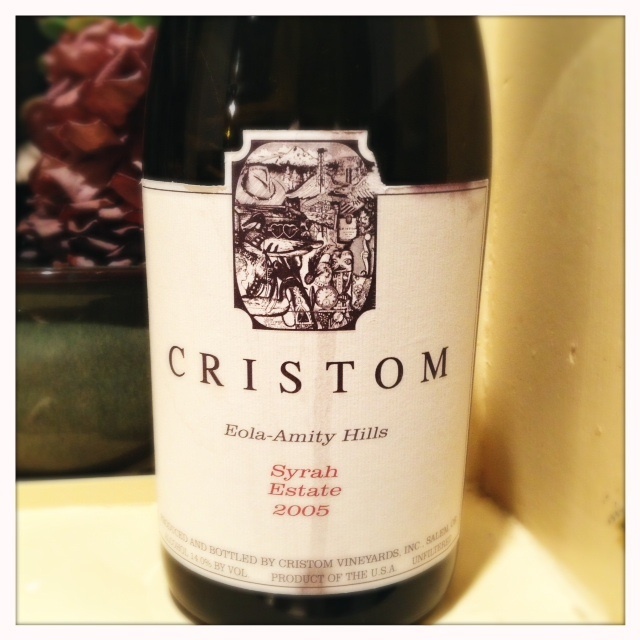 Well known for their Pinot, Cristom was actually the first place in the Willamette Valley to plant Syrah. Thanks to them for their foresight. I wish that there’d been more of it and possibly there is more Syrah than I could find out about on my recent visit. Many of the wine folks I talked to expressed interest in and excitement about Syrah from Western Oregon but it seems very few and far between. I mean, I understand. I know Syrah isn’t exactly the latest and greatest and economically it makes little sense to plant it when Pinot is bringing in the big bucks. But Syrah is such a noble grape and the Willamette Valley could be a great spot to really hit that stylistically cool-climate food friendly Northern Rhone style out of the park. Day 1: The Cristom estate Syrah is really reminiscent of those Northern Rhone Syrahs. It’s got a lot of that familiar peppered meatiness on the palate. This wine is one that is decidedly not fruit forward — it’s dry, it’s got some big tannins, and it needs some time to open up. This is surprising as it’s a already a seven-year-old bottle of wine. On the nose it has some buzzing minerality mixed with sour cherry, wild strawberry, and earth aromas. The mid-palate is a bit richer and fuller than you’d expect with some a serious tannic dryness on the back end. The alcohol comes through a tiny bit. So far, I would say it falls a bit more into the brawny category rather than the elegant one. It’s a good wine but I look forward to seeing how it will taste tomorrow. Day 2: The wine has transitioned to more of a dark salty black olive profile. It’s still a big and tannic wine that really fills up the palate. There’s more fruit, some rich blackberry, and also a bit of vegetal characteristics on this wine which makes me think of whole cluster (10% whole cluster is added) and only adds to the wine’s intrigue. It’s something I like and gives it a complexity and wild rusticity that I think some would find to be too much. Even though this bottle is a few years old, it would be intriguing to try this vintage in another ten years to see how much that rusticity has mellowed and whether the wine subsequently gained more elegance. This was a great wine and a textbook example of authentic Syrah. I had fun in the Willamette Valley, and I look forward to searching out more delicious representations of Syrah from the Willamette Valley’s cooler climate sites.